This 13.3-inch ultraportable weighs only 2.6 pounds, has a Full HD IPS display, Intel Core-M processor, comes loaded with Windows 8.1, and starts at $699 USD. Asus announced the ZenBook UX305 back in September 2014 and unveiled it at CES 2015, last month. Now the company finally announces the availability of this device they also claim to be "world’s slimmest 13.3-inch QHD+ ultraportable" - it only weighs 2.6 pounds and is 0.48-inch thin. This slim portable can last for up to 10 hours on a single charge and features Asus SonicMaster audio with ICEpower technology from Bang & Olufsen. It also has an integrated microphone and 11.26-inch frameless chiclet keyboard. While the model mentioned above is already available in the US at $699 USD, it will get a sibling featuring a QHD+ touchscreen, but the official press release available below only reveals it will arrive "at a later date." World’s slimmest 13.3-inch QHD+ ultraportable at only 0.48-inch thin and weighing 2.6 lbs. Powered by an Intel Core M processor with 8GB RAM and 256GB SSD for superb all-around performance. Sleek new wedge-shaped all-aluminum design with new Obsidian Stone color. Pricing starts at $699 for Full HD model. 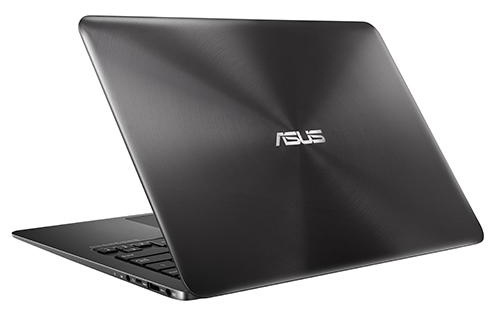 Fremont, CA (February 16, 2015) - ASUS today announced the elegant and powerful ZenBook UX305, which is the world’s slimmest 13.3-inch ultraportable laptop at 0.48-inch thin. The UX305 weighs 2.6lbs and features crisp and vibrant in-plane switching (IPS) anti-glare displays. Powered by the all-new Intel® Core™ M processor for seamless multitasking and standard solid state storage, the UX305 is the ultimate ultraportable laptop for discerning users. Up to 10 hours1 of battery life gives users true all-day computing. 1. Tested in office productivity mode with Wi-Fi connected, Intel® Core™ M 5Y10, 4GB RAM, 128GB SSD, 120cd/m2 bightness. 2. Specifications, content and product availability are all subject to change without notice and may differ from country to country. Actual performance may vary depending on applications, usage, environment and other factors.